Summer seemed to fly by this year and we are now filling rapidly in the run up to Christmas. Plenty of Saturday and the odd Sunday bookings are adding to the busy spell; no time for relaxation! 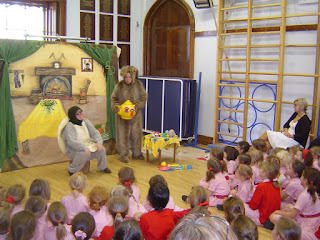 Today we entertained the children at Luton Library with "The Hare & the Tortoise". It was a lovely end of summer day and the square was busy with an international food festival, and firefighters' demonstration; a real carnival atmosphere. On Monday we start in earnest at the schools with bookings every day, and next Sunday we are looking forward to performing at Wyllyots Theatre in Potters bar. The following Saturday you will find us doing two back to back productions of "The Gingerbread Man" at Lauderdale House in Highgate. We love this venue as, having once been the home of Nell Gwynne, it has bags of character. If you still want us before Christmas do pick up the phone and call 07836 731872 or email Albert at brooksa4@sky.com to avoid disappointment.